"Eurosceptic" redirects here. For the Jack Lucien album, see EuroSceptic. The main sources of Euroscepticism have been beliefs that integration undermines national sovereignty and the nation state; that the EU is elitist and lacks democratic legitimacy and transparency; that it is too bureaucratic and wasteful; that it encourages high levels of migration; or perceptions that it is a neoliberal organisation serving the business elite at the expense of the working class, responsible for austerity and driving privatization. Euroscepticism is found in groups across the political spectrum, both left-wing and right-wing, and is often found in populist parties. Although they criticise the EU for many of the same reasons, Eurosceptic left-wing populists focus more on economic issues (such as the European debt crisis and TTIP) while Eurosceptic right-wing populists focus more on nationalism and immigration (such as the European migrant crisis). The recent rise in radical right-wing parties is strongly linked to a rise in Euroscepticism. Eurobarometer surveys of EU citizens show that trust in the EU and its institutions has declined strongly since a peak in 2007. Since then it has been consistently below 50%. A 2009 survey showed that support for EU membership was lowest in the United Kingdom (UK), Latvia and Hungary. By 2016, the countries viewing the EU most unfavourably were the UK, Greece, France and Spain. A referendum on continued EU membership was held in the UK in 2016, which resulted in a 51.9% vote in favour of leaving the EU. Since 2015, trust in the EU has risen slightly in most EU countries as a result of falling unemployment rates and accelerating economic growth. Euroscepticism should not be confused with anti-Europeanism, which is a dislike of European culture and European ethnic groups by non-Europeans. While having some overlaps, Euroscepticism and anti-Europeanism are different. Anti-Europeanism has always had a strong influence in American culture and American exceptionalism, which sometimes sees Europe on the decline or as a rising rival power, or both. Some aspects of Euroscepticism in the United Kingdom have been mirrored by U.S. authors. Flag of the "EUSSR", a common trope among right-wing hard Eurosceptics who seek to match the EU to the USSR. There can be considered to be several different types of Eurosceptic thought, which differ in the extent to which adherents reject integration between member states of the European Union (EU) and in their reasons for doing so. Aleks Szczerbiak and Paul Taggart described two of these as hard and soft Euroscepticism. According to Taggart and Szczerbiak, hard Euroscepticism (also called anti-EU-ism) is "a principled opposition to the EU and European integration and therefore can be seen in parties who think that their countries should withdraw from membership, or whose policies towards the EU are tantamount to being opposed to the whole project of European integration as it is currently conceived." The Europe of Freedom and Direct Democracy group in the European Parliament, typified by such parties as the United Kingdom Independence Party (UKIP), displays hard Euroscepticism. In western European EU member countries, hard Euroscepticism is currently a characteristic of many anti-establishment parties. Some hard Eurosceptics prefer to call themselves 'Eurorealists' rather than 'sceptics', and regard their position as pragmatic rather than "in principle". Additionally, Tony Benn, a left-wing Labour Party MP who fought against European integration in 1975 by opposing membership of the European Communities in that year's referendum on the issue, emphasised his opposition to xenophobia and his support of democracy, saying: "My view about the European Union has always been not that I am hostile to foreigners, but that I am in favour of democracy [...] I think they're building an empire there, they want us to be a part of their empire and I don't want that." The Czech president Václav Klaus rejected the term "Euroscepticism" for its purported negative undertones, saying (at a meeting in April 2012) that the expressions for a Eurosceptic and their opponent should be "a Euro-realist" and someone who is "Euro-naïve", respectively. François Asselineau of the French Popular Republican Union has criticised the use of the term 'sceptic' to describe hard Eurosceptics, and would rather advocate the use of the term "Euro opponent". However, he believes the use of the term 'sceptic' for soft Eurosceptics to be correct, since other Eurosceptic parties in France are "merely criticising" the EU without taking into account the fact that the Treaty of Rome can only be modified with a unanimous agreement of all the EU member states, something he considers impossible to achieve. Soft Euroscepticism is support for the existence of, and membership of, a form of European Union, but with opposition to specific EU policies; or, in Taggart's and Szczerbiak's words, "where there is NOT a principled objection to European integration or EU membership but where concerns on one (or a number) of policy areas lead to the expression of qualified opposition to the EU, or where there is a sense that 'national interest' is currently at odds with the EU's trajectory." The European Conservatives and Reformists group, typified by centre-right parties such as Czech Civic Democratic Party, along with the European United Left–Nordic Green Left which is an alliance of the left-wing parties in the European Parliament, display soft Euroscepticism. Some have claimed that there is no clear line between the presumed 'hard' and 'soft' Euroscepticism. Kopecky and Mudde have said that if the demarcation line is the number of and which policies a party opposes, then the question arises of how many must a party oppose and which ones should a party oppose that makes them 'hard' Eurosceptic instead of 'soft'. Some scholars consider the gradual difference in terminology between 'hard' and 'soft' Euroscepticism inadequate to accommodate the large differences in terms of political agenda. Therefore, "hard Euroscepticism" has also been referred to as "Europhobia" as opposed to mere "Euroscepticism". Other alternative names for 'hard' and 'soft' Euroscepticism include, respectively, "withdrawalist" and "reformist" Euroscepticism. A survey in November 2015[update], conducted by TNS Opinion and Social on behalf of the European Commission, showed that, across the EU as a whole, those with a positive image of the EU are down from a high of 52% in 2007 to 37% in autumn 2015; this compares with 23% with a negative image of the EU, and 38% with a neutral image. About 43% of Europeans thought things were "going in the wrong direction” in the EU, compared with 23% who thought things were going "in the right direction" (11% "don't know"). About 32% of EU citizens tend to trust the EU as an institution, and about 55% do not tend to trust it (13% "don't know"). Distrust of the EU was highest in Greece (81%), Cyprus (72%), Austria (65%), France (65%) and Germany, the United Kingdom (UK) and the Czech Republic (all 63%). Overall, more respondents distrusted their own government (66%) more than the EU (55%). Distrust of national government was highest in Greece (82%), Slovenia (80%), Portugal (79%), Cyprus (76%) and France (76%). A Eurobarometer survey carried out four days prior to and six days after the U.S. presidential election in November 2016 revealed that the surprise victory of Donald Trump caused an increase in the popularity of the European Union in Europe. The increase was strongest among the political right and among respondents who perceived their country as economically struggling. A survey carried out in April 2018 for the European Parliament by Kantar Public consulting found that support for the EU was “the highest score ever measured since 1983”. Support for the EU was up in 26 out of 28 EU countries, the exceptions being Germany and the UK, where support had dropped by about 2% since the previous survey. Almost half (48%) of the 27,601 EU citizens surveyed agreed that their voice counted in the EU, up from 37% in 2016, whereas 46% disagreed with this statement. Two-thirds (67%) of respondents felt that their country had benefited from EU membership and 60% said that being part of the bloc was a good thing, as opposed to 12% who felt the opposite. At the height of the EU's financial and economic crises in 2011, just 47% had been of the view that EU membership was a good thing. Support for EU membership was greatest in Malta (93%), Ireland (91%), Lithuania (90%), Poland (88%), Luxembourg (88%), Estonia (86%) and Denmark (84%) and lowest in Greece (57%), Bulgaria (57%), Cyprus (56%), Austria (54%), the UK (53%) and Italy (44%). When asked which issues should be a priority for the European Parliament, survey respondents picked terrorism as the most pressing topic of discussion, ahead of youth unemployment and immigration. Not all countries shared the same priorities, however. Immigration topped the list in Italy (66% of citizens surveyed considered it a priority issue), Malta (65%) and Hungary (62%) but fighting youth unemployment and support for economic growth were top concerns in Spain, Greece, Portugal, Cyprus and Croatia. Social protection of citizens was the top concern for Dutch, Swedish and Danish respondents. A study analysed voting records of the Fifth European Parliament and ranked groups, concluding: "Towards the top of the figure are the more pro-European parties (PES, EPP-ED, and ALDE), whereas towards the bottom of the figure are the more anti-European parties (EUL/NGL, G/EFA, UEN and EDD)." In 2004, 37 Members of the European Parliament (MEPs) from the UK, Poland, Denmark and Sweden founded a new European Parliament group called "Independence and Democracy" from the old Europe of Democracies and Diversities (EDD) group. The main goal of the ID group was to reject the proposed Treaty establishing a constitution for Europe. Some delegations within the group, notably that from UKIP, also advocated the complete withdrawal of their country from the EU, while others only wished to limit further European integration. The elections of 2009 saw a significant fall in support in some areas for Eurosceptic parties, with all such MEPs from Poland, Denmark and Sweden losing their seats. However, in the UK, the Eurosceptic UKIP achieved second place in the election, finishing ahead of the governing Labour Party, and the British National Party (BNP) won its first ever two MEPs. Although new members joined the ID group from Greece and the Netherlands, it was unclear whether the group would reform in the new parliament. The ID group did reform, as the Europe of Freedom and Democracy (EFD) and is represented by 32 MEPs from nine countries. The elections of 2014 saw a big anti-establishment vote in favour of eurosceptic parties, which took around a quarter of the seats available. Those that won their national elections included: UKIP in the UK (the first time since 1906 that a party other than Labour or the Conservatives had won a national vote), the National Front in France, the People's Party in Denmark and Syriza in Greece. Second places were taken by Sinn Féin in Ireland and the Five Star Movement in Italy. Herman Van Rompuy, the President of the European Council, agreed following the election to re-evaluate the economic area's agenda and to launch consultations on future policy areas with the 28 member states. The Freiheitliche Partei Österreichs (FPÖ), established in 1956, is a right-wing populist party that mainly attracts support from young people and workers. In 1989, it changed its stance over the EU to Euroscepticism. It opposed Austria joining the EU in 1994, and opposed the introduction of the euro in 1998. The party would like to leave the EU if it threatens to develop into a country, or if Turkey joins. The FPÖ received 20–27% of the national vote in the 1990s, and more recently received 17.5% in 2008. Following the 2017 Austrian legislative election, it has 51/183 National Council seats, 16/62 Federal Council seats, and 4/19 European Parliament seats. The Bündnis Zukunft Österreich (BZÖ), established in 2005, is a socially conservative party that has always held Eurosceptic elements. In 2011 the party openly supported leaving the eurozone, and in 2012 it announced that it supported a full withdrawal from the European Union. The party has also called upon a referendum on the Lisbon Treaty. In polls it currently receives around 10%–15%, although in one state it did receive 45% of the vote in 2009. Since the 2017 election, it has 0/183 National Council seats, 0/62 Federal Council seats, and 0/19 European Parliament seats. Ewald Stadler, a former member of FPÖ (and later of BZÖ) was very Eurosceptic, but in 2011 became member of the European Parliament due to the Lisbon Treaty. Before Stadler accepted the seat, this led to heavy critics by Jörg Leichtfried (SPÖ) "Stadler wants to just rescue his political career" because Stadler before mentioned he would never accept a seat as MEP if this was only due to the Lisbon Treaty. On 23 December 2013 he founded a conservative and Eurosceptic party called The Reform Conservatives, although it’s been inactive since June 2016. In the 2014 European Parliament election, the FPÖ increased its vote to 19.72% (up 7.01%), gaining 2 new MEPs, making a total of 4; the party came third, behind the ÖVP and the SPÖ. EU-STOP (the electoral alliance of the EU Withdrawal Party and the Neutral Free Austria Federation) polled 2.76%, gaining no seats, and the Reform Conservatives 1.18%, with Team Stronach putting up no candidates. The main Eurosceptic party in Belgium is Vlaams Belang. In the 2014 European Parliament election, Belgium's Vlaams Belang lost over half of its previous vote share, polling 4.26% (down 5.59%) and losing 1 of its 2 MEPs. Volen Siderov, leader of the Bulgarian Eurosceptic party Attack. Parties with mainly Eurosceptic views are Union of Communists in Bulgaria, NFSB, Attack, and VMRO – BND, which is a member of the Eurosceptic European Conservatives and Reformists). Bulgaria's Minister of Finance, Simeon Djankov, stated in 2011 that ERM II membership to enter the Euro zone would be postponed until after the Eurozone crisis had stabilised. In the 2014 European Parliament election Bulgaria remained overwhelmingly pro-EU, with the Eurosceptic Attack party receiving 2.96% of the vote, down 9%, with the splinter group National Front for the Salvation of Bulgaria taking 3.05%; neither party secured any MEPs. A coalition between VMRO – BND and Bulgaria Without Cencorship secured an MEP position for Angel Dzhambazki from IMRO, who is a soft eurosceptic. Followers of Eurosceptic Attack tore down and trampled the European flag on 3 March 2016 at a meeting of the party in the Bulgarian capital Sofia, dedicated to the commemoration of the 138th anniversary of the liberation of Bulgaria from the Ottoman Empire. Parties with Eurosceptic views are mainly small right-wing parties like Croatian Party of Rights, Croatian Party of Rights dr. Ante Starčević, Croatian Pure Party of Rights, Autochthonous Croatian Party of Rights, Croatian Christian Democratic Party and Only Croatia – Movement for Croatia. The only parliamentary party that is vocally eurosceptic is the Human Shield that won 5 out of 151 seats at the 2016 parliamentary election,. Their position is generally considered to waver between hard and soft Euroscepticism; it requests thorough reform of the EU so that all member states would be perfectly equal. In May 2010, the Czech president Václav Klaus claimed that they "needn't hurry to enter the Eurozone". Petr Mach, an economist, a close associate of president Václav Klaus and a member of the Civic Democratic Party between 1997 and 2007, founded the Free Citizens Party in 2009. The party aims to mainly attract dissatisfied Civic Democratic Party voters. At the time of the Lisbon Treaty ratification, they were actively campaigning against it, supported by the president Vaclav Klaus, who demanded opt-outs such as were granted to the United Kingdom and Poland, unlike the governing Civic Democratic Party, who endorsed it in the Chamber of Deputies. After the treaty has been ratified, Mach's party is in favour of withdrawing from the European Union completely. In the 2014 European Parliament election, the Free Citizens Party won one mandate and allied with UKIP in the Europe of Freedom and Direct Democracy (EFD). The 2017 Czech legislative election brought into Parliament three Eurosceptic parties. The soft Eurosceptic Civic Democratic Party (ODS) is the second largest, the new hard Eurosceptic Freedom and Direct Democracy (SPD) is the fourth largest and the Communist Party of Bohemia and Moravia (KSČM) that is largely regarded as a Eurosceptic party is the fifth largest party in the Czech parliament. An April 2016 survey by the CVVM Institute indicated that 25% of Czechs were satisfied with EU membership, down from 32% the previous year. Dividends worth CZK 270 billion were paid to the foreign owners of Czech companies in 2017, which has become a political issue in the Czech Republic. Parties with mainly Eurosceptic views in Cyprus are New Internationalist Left, the Progressive Party of Working People, Committee for a Radical Left Rally and ELAM. The People's Movement against the EU only takes part in European Parliament elections and has one member in the European Parliament. The soft Eurosceptic June Movement, originally a split-off from the People's Movement against the EU, existed from 1992 to 2009. In the Danish Parliament, the Unity List has withdrawal from the EU as a policy. The Danish People's Party also advocates withdrawal, but has claimed to support some EU structures such as the internal market, and supported the EU-positive Liberal-Conservative coalition between 2001 and 2011 and again from 2015 to present. The Socialist People's Party, minorities within the Social Liberal Party and Social Democratic Party, and some smaller parties were against accession to the European Union in 1972. Still in 1986, these parties advocated a no vote in the Single European Act referendum. Later, the Social Liberal Party changed to a strongly EU-positive party, and EU opposition within the Social Democratic Party faded. The Socialist People's Party were against the Amsterdam Treaty in 1998 and Denmark's joining the euro in 2000, but has become increasingly EU-positive, for example when MEP Margrete Auken left the European United Left–Nordic Green Left and joined The Greens–European Free Alliance in 2004. In the 2014 European Parliament election, the Danish People's Party came first by a large margin with 26.6% of the vote, gaining 2 extra seats for a total of 4 MEPs. The People's Movement against the EU polled 8.1%, retaining its single MEP. The Independence Party and Centre Party were against accession to the EU, but only the Independence Party still wants Estonia to withdraw from the EU. The Conservative People's Party (EKRE) also has some Eurosceptic policies. The largest Eurosceptic party in Finland is the Finns Party. In the European Parliament election, 2014, the Finns Party increased their vote share by 3.1% to 12.9%, adding a second MEP. With their 39 seats, the Finns Party are also the second-biggest party in the 200-seat Finnish Eduskunta. In Eurobarometer 77 (fieldwork in Spring 2012), 41% of Finns trusted the European Union (EU-27 average: 31%), 51% trusted The European Parliament (EU-27average: 40%), and 74% were in favour of the euro currency (EU-27 average: 52%). Marine Le Pen, prominent French MEP, former leader and former presidential candidate of the National Front (France) and of the Europe of Nations and Freedom group. In France there are multiple parties that are Eurosceptic to different degrees, varying from advocating less EU intervention in national affairs, to advocating outright withdrawal from the EU and the Eurozone. These parties belong to all sides of the political spectrum, so the reasons for their Euroscepticism may differ. In the past many French people appeared to be uninterested in such matters, with only 40% of the French electorate voting in the 2009 European Parliament elections. Right-wing Eurosceptic parties include the Gaullist Debout la République, and Mouvement pour la France, which was part of Libertas, a pan-European Eurosceptic party. In the 2009 European Parliament elections, Debout la République received 1.77% of the national vote, and Libertas 4.8%. In a similar way to some moderate parties, the French right and far-right in general are naturally opposed to the EU, as they criticise France's loss of political and economic sovereignty to a supranational entity. Some of these hard Eurosceptic parties include the Popular Republican Union and the Front National (FN). Front National and Popular Republican Union both seek France's withdrawal from the EU and the euro, although Popular Republican Union also seeks France's withdrawal from NATO. The FN received 33.9% of the votes in the French presidential election, 2017, making it the largest Eurosceptic party in France. Eurosceptic parties on the left in France tend to criticise what they see as the neoliberal agenda of the EU, as well as the elements of its structure which are undemocatic and seen as top-down. These parties include the Parti de Gauche and the French Communist Party, which formed the Front de Gauche for the 2009 European Parliament elections and received 6.3% of the votes. The leader of the Left Front defends a complete reform of the Monetary Union, rather than the withdrawal of France from the Eurozone. Some of the major far-left Eurosceptic parties in France include the New Anticapitalist Party which received 4.8% and Lutte Ouvrière which received 1.2%. The Citizen and Republican Movement, a left-wing Eurosceptic and souverainist party, have not participated in any elections for the European Parliament. The party Chasse, Pêche, Nature & Traditions, is an agrarianist Eurosceptic party that claims to be neither left nor right. In the European Parliament election, 2014, the National Front won the elections with 24.85% of the vote, a swing of 18.55%, winning 24 seats, up from 3 previously. The former French President François Hollande had called for the EU to be reformed and for a scaling back of its power. The Alternative for Germany (AfD) is Germany's largest Eurosceptic party. It has been elected into the German Parliament with 94 seats in September 2017. Initially the AfD was a soft Eurosceptic party, that considered itself pro-Europe and pro-EU, but opposed the euro, which it believed had undermined European integration. In the European Parliament election, 2014, the Alternative for Germany came 5th with 7% of the vote, winning 7 seats and is a member of the Eurosceptic European Conservatives and Reformists. The Alternative for Germany went on to take seats in three state legislatures in the Autumn of 2014. The party became purely Eurosceptic in 2015, when a split occurred in the party, leading to Frauke Petry's leadership and a more hard line approach to the European Union. In July 2015 a split from AfD created a new soft Eurosceptic party called Alliance for Progress and Renewal. Golden Dawn, Communist Party of Greece (KKE), ANEL, Course of Freedom, Popular Unity, and LAOS are the main Eurosceptic parties in Greece. According to the London School of Economics, Greece is the 2nd most Eurosceptic country in the European Union, with 50% (only behind UK) of the Greeks thinking that their country has not benefited at all from the EU. Meanwhile, 33% of the Greeks views Greek membership in EU as a good thing, marginally ahead of UK. 81% of the Greeks say that the EU is going in the wrong direction. These figures represent a major increase in Euroscepticism in Greece since 2009. In June 2012, the Eurosceptic parties in Greece that were represented in the parliament before the Election in January 2015 (ANEL, Golden Dawn, KKE) got 45.8% of the votes and 40.3% of the seats in the parliament. In the legislative election of January 2015 the pro-European (left and right-wing) parties (ND, PASOK, Potami, KIDISO, EK and Prasinoi-DIMAR) got 43.28% of the votes. The Eurosceptic parties got 54.64%. The Eurosceptic left (KKE, ANTARSYA-MARS and KKE (M–L)/M–L KKE) got 42.58% of the votes and the Eurosceptic right (Golden Dawn, ANEL and LAOS) got 12.06% of the votes, with Syriza ahead with 36.34%. The Eurosceptic parties got 194 seats in the new parliament and the pro-EU parties got 106 seats. According to the polls conducted in June and July 2015 (12 polls), the Eurosceptic left would get on average 48.03% (excluding extraparliamentary parties as ANTARSYA-MARS and KKE (m–l)/ML-KKE), the parliamentary pro-EU parties (Potami, New Democracy and PASOK) would get 33.82%, the extra-parliamentary (not represented in the Hellenic Parliament) pro-EU parties (KIDISO and EK) would get 4.44% and the Eurosceptic right would get 10.2% (excluding extraparliamentary parties, such as LAOS, not displayed on recent opinion polls). The soft Eurosceptic parties would get 42.31%, the hard Eurosceptic parties (including KKE, ANEL and Golden Dawn) would get 15.85%, and the pro-EU parties (including extra-parliamentary parties displayed on opinion polls) would get 38.27% of the votes. In the European Parliament election, 2014, Syriza won the election with 26.58% of the vote (a swing of 21.88%) taking 6 seats (up 5), with Golden Dawn coming 3rd taking 3 seats, the Communist Party taking 2 seats and the Independent Greeks gaining their first ever seat. Syriza's leader Tsipras said he's not anti-European and does not want to leave the euro. According to The Economist, Tsipras is willing to negotiate with Greece's European partners, and it is believed a Syriza victory could encourage radical leftist parties across Europe. Alexis Tsipras vowed to reverse many of the austerity measures adopted by Greece since a series of bailouts began in 2010, at odds with the Eurogroup's positions. The current government coalition in Greece is composed by Syriza and ANEL (right-wing hard Eurosceptic party, led by Panos Kammenos, who is the current Minister of Defence). Viktor Orbán is the soft Eurosceptic Prime Minister of Hungary for the national-conservative Fidesz Party. Another Eurosceptic party in Hungary is Jobbik, a radical, xenophobic and far-right party. In Hungary 39% of the population have a positive image of the EU, 20% have a negative image, and 40% neutral (1% "Don't know"). In the 2014 Hungarian parliamentary election, Fidesz got 44.54% of the votes, Jobbik got 20.54% of the votes and the communist Hungarian Workers' Party got 0.58% of the votes. Thus, Eurosceptic parties in Hungary obtained 65.66% of the votes, one of the highest figures in Europe. The green-liberal Politics Can Be Different classifies as a soft or reformist Eurosceptic party given its self-professed euro-critical stance. During the European parliamentary campaign of 2014 party Co-President András Schiffer described LMP as having a pronounced pro-integration position on environmental, wage and labour policy however, as supporting member state autonomy on the self-determination of local communities concerning land resources. So as to combat the differentiated integration of the multi-speed Europe which discriminates against Eastern and Southern member states, LMP would like to initiate an eco-social market economy within the union. Euroscepticism is a minority view in Ireland, with opinion polls from 2016 to 2018 indicating growing support for EU membership, moving from 70% to 92% in that time. The Irish people initially voted against ratifying the Nice and Lisbon Treaties. However following renegotiations, second referendums on both were passed with approximately 2:1 majorities in both cases. Some commentators and smaller political groups questioned the validity of the Irish Government's decision to call second referendums. The left-wing Irish republican party Sinn Féin expresses soft Eurosceptic positions on the current structure of the European Union and the direction in which it is moving. The party expresses, "support for Europe-wide measures that promote and enhance human rights, equality and the all-Ireland agenda", but has a "principled opposition" to a European superstate. However, in its manifesto for the 2015 UK general election, Sinn Féin pledged that the party would campaign for the UK to stay within the EU. In the last European Parliament election in 2014, Sinn Féin won 3 seats coming second in seats and third in votes with 19.5% of the vote up 8.3%. The Trotskyist organisation, the Socialist Party, supports Ireland leaving the EU and supported the Brexit result. It argues that the European Union is institutionally capitalist and neoliberal. The Socialist Party campaigned against the Lisbon and Nice Treaties and favours the foundation of an alternative Socialist European Union. Beppe Grillo, leader of the Italian Five Star Movement, a Eurosceptic party. Matteo Salvini with the Eurosceptic economist Claudio Borghi Aquilini during No Euro Day. The Five Star Movement (M5S), an anti-establishment movement founded by the former comedian Beppe Grillo, is often considered a Eurosceptic party. The M5S gained 25.5% of vote in the 2013 general election, becoming the largest anti-establishment and Eurosceptic party in Europe. The party also advocates a non-binding referendum on the withdrawal of Italy from the Eurozone (but not from the European Union) and the return to the lira. The M5S's popular support is evenly distributed all across Italy, but in 2013 the party was particularly strong in Sicily, Liguria and Marche, where it gained more than 30% of the vote. Another Eurosceptic party is Lega Nord, a regionalist movement led by Matteo Salvini favouring Italy's exit from the Eurozone and the re-introduction of the lira. When in government, LN however approved the Treaty of Lisbon. The party won 6.2% of the vote in the 2014 European Parliament elections, but two of its leading members are presidents of Lombardy and Veneto (where LN gained 40.9% of the vote in 2015). In the European Parliament election, 2014 the Five Star Movement came second, gaining 17 seats and 21.2% of the vote in contesting EP seats for the first time. Lega Nord took 5 seats and The Other Europe with Tsipras gained 3 seats. Other minor eurosceptic organizations include right-wing political parties (e.g., Brothers of Italy, Tricolour Flame, New Force, National Front, CasaPound, National Movement for Sovereignty, the No Euro Movement), left-wing political parties (e.g., the Communist Party of Marco Rizzo, the Italian Communist Party) and other political movements (e.g., the Sovereignist Front, MMT Italy). In addition, the European Union is criticized (especially for the austerity and the creation of the euro) by some left-wing thinkers, like the trade unionist Giorgio Cremaschi and the journalist Paolo Barnard, and some academics, such as the economists Alberto Bagnai and Vladimiro Giacchè, the philosopher Diego Fusaro and the mathematician Marino Badiale. According to the Standard Eurobarometer 87 conducted by the European Commission in the spring of 2017, 48% of Italians tend not to trust the European Union compared to 36% of Italians who trust it. In the 2018 general election the Eurosceptic parties (including Five Star Movement, Lega Nord, Brothers of Italy, Power to the People, CasaPound, Italy for the Italians and Communist Party) won 57.18% of the votes, while the pro-EU parties (including Democratic Party, Forza Italia, Free and Equal, More Europe, Us with Italy-UdC, Together and Popular Civic List) won 41.54% of the votes. The National Alliance (For Fatherland and Freedom/LNNK/All for Latvia! ), Union of Greens and Farmers and For Latvia from the Heart are parties that are described by some political commentators as bearing soft Eurosceptic views. A small hard Eurosceptic party Eurosceptic Party of Action [lv] exists, but it has failed to gain any administrative seats throughout history of its existence. The Order and Justice party has mainly Eurosceptic views. The Alternative Democratic Reform Party is a soft Eurosceptic party. It is a member of the Alliance of European Conservatives and Reformists. The Labour Party was not in favour of Malta entering the European Union. However, it was in favour of a partnership with the EU. After a long battle, the Nationalist Party led by Eddie Fenech Adami won the referendum and the following election, making Malta one of the states to enter the European Union on 1 May 2004. The party is now pro-European. Geert Wilders, leader of the Party for Freedom, a hardline Dutch Eurosceptic party and a prominent anti-Islamic radicalism party. Historically, the Netherlands have been a very pro-European country, being one of the six founding members of the European Coal and Steel Community in 1952, and campaigning with much effort to include the United Kingdom into the Community in the 1970s and others after that. It has become slightly more Eurosceptic in the 2000s, rejecting the European Constitution in 2005 and complaining about the relatively high financial investment into the Union or the democratic deficit amongst other issues. The nationalist Party for Freedom (founded in 2006) wants the Netherlands to leave the EU in its entirety, because it believes the EU is undemocratic, costs money and cannot close the borders for immigrants. The Socialist Party believes the European Union has already brought Europe 50 years of peace and prosperity, and argues that European co-operation is essential for tackling global problems like climate change and international crime. However, the SP opines that the current Union is dominated by the big businesses and the big countries, while the labour movement, consumer organisations and smaller companies are often left behind. "Neoliberal" measures have supposedly increased social inequality, and perhaps the Union is expanding too fast and taking on too much power in issues that should be dealt with on a national level. The conservative Protestant Reformed Political Party and the Christian Union favour co-operation within Europe, but reject a superstate, especially one that is dominated by Catholics, or that infringes on religious rights and/or privileges. The ecologist Party for the Animals favours European co-operation, but believes the current EU does not respect animal rights enough and should have a more active policy on environment protection. Despite these concerns, in 2014 the majority of the Dutch electorate continued to support parties that favour ongoing European integration: the Social Democrats, the Christian Democrats, the Liberals, but most of all the (Liberal) Democrats. In 2016, a substantial majority in a low-turnout referendum rejected the ratification of an EU trade and association treaty with Ukraine. "Trumna dla rybaków" ("Coffin for fishermen"). A sign visible on the sides of many Polish fishing boats. It depicts an obscene Slavic gesture. Polish fishermen protest against the EU's prohibition of cod fishing on Polish ships. Parties with mainly Eurosceptic views are Liberty, Congress of the New Right, National Movement (together with Real Politics Union). Former president of Poland Lech Kaczyński resisted giving his signature on behalf of Poland to the Treaty of Lisbon, objecting specifically to the Charter of Fundamental Rights of the European Union. Subsequently, Poland got an opt-out from this charter. As Polish President, Kaczyński also opposed the Polish government's intentions to join the euro. In 2015, it was reported that Euroscepticism was growing in Poland, which was thought to be due to the "economic crisis, concern over perceived interference from Brussels and migration". Polish president Andrzej Duda indicated that he wished for Poland to step back from further EU integration. He suggested that the country should "hold a referendum on joining the euro, resist further integration and fight the EU’s green policies", despite getting largest share of EU cash. The main Eurosceptic parties in Portugal are National Renovator Party (PNR), Portuguese Communist Party (PCP), and Left Bloc (BE). Opinion polling in Portugal in 2015 indicated that 48 per cent tended not to trust the EU, while 79 per cent tended not to trust the Portuguese government (then led by Portugal Ahead). Eurosceptic political parties hold a combined total of 34 seats out of 230 in Portugal's parliament (BE 19, PCP 15, PNR 0) and a combined total of 4 out of Portugal's 21 seats in the European parliament (PCP 3, BE 1, PNR 0). In the last European Parliament election, 2014, the Portuguese Communist Party won three seats and the Left Bloc won one seat. Several parties espousing Eurosceptic views exist on the right, such as the New Republic, the Greater Romania Party and Noua Dreaptă, but as of August 2016 none of these parties are represented in European Parliament. Euroscepticism is relatively unpopular in Romania; all mainstream political parties are pro-European and a 2015 survey found 65% of Romanians had a positive view of the country's EU membership. Parties with primarily hard Eurosceptic views represented in the National Council are People's Party - Our Slovakia and We Are Family. Prominent Slovak Eurosceptic politicians include Marian Kotleba, Boris Kollár, Andrej Danko and Richard Sulík . Soft Eurosceptic views are represented in Slovak National Party, New Majority and Freedom and Solidarity. Parties with mainly Eurosceptic views are Slovenian National Party and United Left. Candidatura d'Unitat Popular, a left-wing to far-left political party with about 1,300 members, advocates independence for Catalonia outside of the European Union. Spain was one of the few countries to vote Yes for the European Constitution in a referendum in February 2005, though by a lower margin in Catalonia and the Basque Country. However, trust in the EU later declined. As of 2015[update], according to a Eurobarometer public opinion survey, 61 per cent of the Spanish people did not trust the EU, compared to 25% that trust it (14% "don't know"). The Left Party of Sweden is against accession to the eurozone and wants Sweden to leave the European Union. The right-wing populist party Sweden Democrats are also strongly against the Union but not to withdraw EEA and Schengen Agreement. The June List, a Eurosceptic list consisting of members from both the political right and left won three seats in the 2004 Elections to the European Parliament and sat in the EU-critical IND/DEM group in the European Parliament. The movement Folkrörelsen Nej till EU [sv] favours a withdrawal from the EU. Around 75% of the Riksdag members represent parties that officially supports the Sweden membership. In the European Parliament election, 2014, the Sweden Democrats gained 2 seats with 9.67% of the vote, up 6.4%, and the Left Party took one seat with 6.3% of the vote. Nigel Farage, former Leader of the UK Independence Party and co-leader of the Europe of Freedom and Direct Democracy group in the European Parliament. Farage is one of the most prominent Eurosceptic figures in the UK. Euroscepticism in the United Kingdom has been a significant element in British politics since the inception of the European Economic Community (EEC), the predecessor to the EU. The European Union strongly divides the British public, political parties, media and civil society. The UK Independence Party has backed the idea of the UK unilaterally leaving the European Union (Brexit) since its inception in 1993. During the 23 June 2016 referendum on the issue, the Conservatives had no official position on the issue; although its leader David Cameron was in favour of remaining in the EU, the party was split on the issue. The Labour Party officially supported remaining in the EU, although party leader Jeremy Corbyn did suggest early on in the campaign that he would consider withdrawal; which he advocated years previously. The Liberal Democrats were the most adamantly pro-EU party, and since the referendum, pro-Europeanism has been their main policy. The referendum resulted in an overall vote to leave the EU, as opposed to remaining an EU member, by 51.9% to 48.1%, on a turnout of 72.2%. The vote was split between the constituent countries of the United Kingdom, with a majority in England and Wales voting to leave, and a majority in Scotland and Northern Ireland, as well as Gibraltar (a British Overseas Territory), voting to remain. As a result of the referendum, the government notified the EU of its intention to withdraw on 29 March 2017 by invoking Article 50 of the Lisbon Treaty. Prosperous Armenia represents the main Eurosceptic party in Armenia. Following the 2018 Armenian parliamentary election, the party gained 26 seats in the National Assembly. The party is a member of the Alliance of Conservatives and Reformists in Europe. The three main Eurosceptic parties in Iceland are the Independence Party, Left-Green Movement and the Progressive Party. The Independence Party and the Progressive Party won the parliamentary election in April 2013 and they have halted the current negotiations with the European Union regarding Icelandic membership and tabled a parliamentary resolution on 21 February 2014 to withdraw the application completely. The two main Eurosceptic parties in Moldova are the left-wing Party of Socialists of the Republic of Moldova, which officially declared its main purpose to be the integration of Moldova in the Eurasian Economic Union and the Party of Communists of the Republic of Moldova, even if nowadays its leader speech became more soft on the issue of Euroscepticism. As of November 2014 both parties are represented in Moldovan Parliament, with 45 MPs out of a total of 101 MPs. All parliamentary parties in Montenegro officially support the country's bid for accession to the European Union. The only party that rejected the European integration and instead publicly advocates a tighter political and economic integration with Russia was the non-parliamentary far-right party Serb List. Norway has rejected EU membership in two referendums, 1972 and 1994. The Centre Party, Christian Democratic Party, Socialist Left Party and Liberal Party were against EU membership in both referendums. The Centre Party, Socialist Left Party, Capitalist Party, Christians and Red Party are also against Norway's current membership of the European Economic Area. Russian President Vladimir Putin is an outspoken Eurosceptic who has successfully promoted an alternative Economic Union with Armenia, Belarus, Kazakhstan and Kyrgyzstan – the Eurasian Economic Union. Parties with mainly Eurosceptic views are the Communist Party of the Russian Federation, United Russia and Liberal Democratic Party of Russia. Following the 2014 Crimean crisis, the European Union issued sanctions on the Russian Federation "in response to the illegal annexation of Crimea and deliberate destabilisation of a neighbouring sovereign country". In response to this, Alexey Borodavkin – Russia's permanent representative with the UN – said "The EU is committing a direct violation of human rights by its actions against Russia. The unilateral sanctions introduced against us are not only illegitimate according to international law, they also undermine Russian citizens' freedom of travel, freedom of development, freedom of work and others". In the same year, Russian president Vladimir Putin said: "What are the so-called European values? Maintaining the coup, the armed seizure of power and the suppression of dissent with the help of the armed forces?" A February 2014 poll conducted by the Levada Center, Russia's largest independent polling organization, found that nearly 80% of Russian respondents had a "good" impression of the EU. This changed dramatically in 2014 with the Ukrainian crisis resulting in 70% taking a hostile view of the EU compared to 20% viewing it positively. A Levada poll released in August 2018 found that 68% of Russians polled believe that Russia needs to dramatically improve relations with Western countries. 42% of Russian respondents said they had a positive view of the EU, up from 28% in May 2018. A referendum was held in the landlocked microstate on 20 October 2013 in which the citizens were asked whether the country should submit an application to join the European Union. The proposal was rejected because of a low turnout, even though 50.3% of voters approved it. The "Yes" campaign was supported by the main left-wing parties (Socialist Party, United Left) and the Union for the Republic whereas the Sammarinese Christian Democratic Party suggested voting with a blank ballot, the Popular Alliance declared itself neutral, and We Sammarinese and the RETE movement supported the "No" campaign. The Citizens' Rights Directive, which defines the right of free movement for the European citizens, may have been an important reason for those voting no. Parties with mainly Eurosceptic views are Serbian Radical Party, Democratic Party of Serbia, Dveri and Serbian People's Party of Nenad Popović. Switzerland has long been known for its neutrality in international politics. Swiss voters rejected EEA membership in 1992, and EU membership in 2001. Despite the passing of several referendums calling for closer relations between Switzerland and the European Union such as the adoption of bilateral treaties and the joining of the Schengen Area, a second referendum of the joining of the EEA or the EU is not expected, and the general public remains opposed to joining. In February 2014, the Swiss voters narrowly approved a referendum limiting the freedom of movement of EU citizens to Switzerland. Eurosceptic political parties include the Swiss People's Party, which is the largest political party in Switzerland, with 29.4% of the popular vote as of the 2015 federal election. Smaller Eurosceptic parties include, but are not limited to, the Federal Democratic Union, the Ticino League, and the Geneva Citizens' Movement, all of which are considered right-wing parties. In addition, the Campaign for an Independent and Neutral Switzerland is a political organisation in Switzerland that is strongly opposed to Swiss membership of or further integration otherwise with the European Union. Regionally, the German-speaking majority as well as the Italian-speaking areas are the most Eurosceptic, while French-speaking Switzerland tends to be more pro-European integration. However, in the 2001 referendum, the majority of French-speakers voted against EU membership. According to a 2016 survey conducted by M.I.S Trend and published in L'Hebdo, 69 percent of the Swiss population supports systematic border controls, and 53 percent want restrictions on the EU accord of the free movements of peoples and 14 percent want it completely abolished. However, 54% of the Swiss population said that if necessary, they would ultimately keep the freedom of movement of people's accord. The two main Eurosceptic parties are the far-right ultranationalist, Nationalist Movement Party (MHP), which secured 16.29% of votes, and 40 seats in the Parliament at the last election, and the Felicity Party (Saadet Partisi), a far-right Sunni Islamist party, which has no seats in the Parliament, as it only secured 0.68% of the votes in the last election, far below the 10% threshold necessary to be represented in the Parliament. Many left-wing nationalist and far-left parties hold no seats at parliament but they control many activist and student movements in Turkey. The Patriotic Party (formerly called Workers' Party) consider the European Union as a frontrunner of global imperialism. Dmytro Yarosh, leader of the Ukrainian hard Eurosceptic party Right Sector. Parties with mainly Eurosceptic views are Party of Regions, Communist Party of Ukraine and Right Sector. The far-right Ukrainian group Right Sector opposes joining the European Union. It regards the EU as an "oppressor" of European nations. ^ Kirk, Lisbeth (22 June 2011). "EU scepticism threatens European integration". EU Observer. Retrieved 1 February 2016. ^ "Marine Le Pen's Real Victory". The Atlantic, 7 May 2017. ^ a b Alibert, Juliette. Euroscepticism: The root causes and how to address them. Heinrich Böll Foundation. October 2015. ^ Hannan, Daniel (14 November 2007). "Why aren't we shocked by a corrupt EU?". The Daily Telegraph. London. Retrieved 2 May 2010. ^ a b Jones, Owen. "The left must put Britain's EU withdrawal on the agenda". The Guardian, 14 July 2015. ^ "Party like it's 1975: how the Left got Eurosceptic all over again". New Statesman, 2 November 2015. ^ a b c d Standard Eurobarometer 84 Autumn 2015 Report: Public opinion in the European Union, Language version EN. European Union. 2016. pp. 104–113. doi:10.2775/89997. ISBN 978-92-79-57781-9. Catalogue No. NA-04-16-323-EN-N. Retrieved 26 October 2016. ^ "Standard Eurobarometer 71 (fieldwork June–July 2009)" (PDF). European Commission. September 2009. pp. 91–3. Retrieved 26 November 2009. ^ "European spring – Trust in the EU and democracy is recovering". ^ a b Chamorel, Patrick. "Anti-Europeanism and Euroscepticism in the United States, No. 2004/25" (PDF). European University Institute. Robert Schuman Centre for Advanced Studies (RSCAS). Retrieved 20 September 2015. ^ Daniel Hannan MEP (19 October 2012). "You thought the whole 'EUSSR' thing was over the top? Have a look at this poster". The Daily Telegraph. Retrieved 20 September 2014. ^ a b Arato, Krisztina; Kaniok, Petr. Euroscepticism and European Integration. CPI/PSRC. p. 162. ISBN 978-953-7022-20-4. ^ a b Harmsen et al (2005), p. 18. ^ a b Gifford, Chris (2008). The Making of Eurosceptic Britain. Ashgate Publishing. p. 5. ISBN 978-0-7546-7074-2. ^ a b Lewis, Paul G; Webb, Paul D (2003). Pan-European Perspectives on Party Politics. Brill. p. 211. ISBN 978-90-04-13014-2. ^ Tony Benn (25 March 2013). European Union. Oxford Union. ^ "Radio Prague: Current Affairs". Archived from the original on 3 March 2016. Retrieved 28 July 2013. ^ Asselineau, François. "« Européens convaincus » contre « Eurosceptiques » : Le retour de la Sainte Inquisition", Popular Republican Union, 16 December 2010. Retrieved 29 October 2013. ^ Laurent De Boissieu (15 March 2012). "Présidentielle: Ces "petits" candidats qui veulent se faire entendre" [Presidential election: These "small" candidates who want to be heard]. La Croix (in French). Retrieved 9 March 2016. ^ Taggart, Paul; Szczerbiak, Aleks (2001). The Party Politics of Euroscepticism in EU Member and Candidate States. Sussex European Institute. p. 7. Retrieved 4 August 2015. ^ Sofia Vasilopoulou. Varieties of Euroscepticism:The Case of the European Extreme Right. ^ Yves Bertoncini; Nicole König (27 November 2014). "Euroscepticism or Europhobia: Voice vs. Exit?" (PDF). Policy paper (121). Jacques Delors Institute: 6 ff. Retrieved 24 June 2016. ^ "European Sources Online Information Guide: Euroscepticism" (PDF). Cardiff University Press. April 2015. p. 3. Retrieved 9 March 2016. ^ a b "Il Fatto Quotidiano - Unione europea, in caso di referendum solo il 44% degli italiani voterebbe per restare: la percentuale più bassa d'Europa" [Il Fatto Quotidiano - European Union, in case of referendum only 44% of Italians would vote to stay: the lowest percentage in Europe]. ilfattoquotidiano.ti (in Italian). 17 October 2018. Retrieved 18 October 2018. ^ a b Standard Eurobarometer 84 Autumn 2015 Report: Public opinion in the European Union, Language version EN. European Union. 2016. pp. 114–119. doi:10.2775/89997. ISBN 978-92-79-57781-9. Catalogue No. NA-04-16-323-EN-N. Retrieved 26 October 2016. ^ Standard Eurobarometer 84 Autumn 2015 Report: Public opinion in the European Union, Language version EN. European Union. 2016. pp. 87–92. doi:10.2775/89997. ISBN 978-92-79-57781-9. Catalogue No. NA-04-16-323-EN-N. Retrieved 26 October 2016. ^ a b Standard Eurobarometer 84 Autumn 2015 Report: Public opinion in the European Union, Language version EN. European Union. 2016. pp. 73–75. doi:10.2775/89997. ISBN 978-92-79-57781-9. Catalogue No. NA-04-16-323-EN-N. Retrieved 26 October 2016. ^ Heath, Ryan (23 May 2018). "Europeans love the EU (and populists too)". Politico.eu. ^ Simon Hix; Abdul Noury (17 March 2006). "After Enlargement: Voting Behaviour in the Sixth European Parliament" (PDF). The UK Federal Trust for Education and Research. Archived from the original (PDF) on 25 September 2006. ^ Nordland, Rod (4 October 2008). Charging To The Right. Newsweek. Retrieved 13 June 2010. ^ "BZÖ will raus aus der Euro-Zone". Österreich (in German). 21 June 2012. Retrieved 9 November 2012. ^ "BZÖ wird "rechtsliberal"". Die Presse (in German). 15 October 2009. Retrieved 9 July 2011. ^ "Austrian magnate's new party wants to dump euro". The Irish Times. 23 August 2012. Retrieved 26 August 2012. ^ "Stronach-Partei: Gerüchte um vierten Mandatar "falsch"". Die Presse (in German). 26 August 2012. Retrieved 12 May 2012. ^ "Zerfallserscheinungen beim BZÖ". Kurier (in German). 12 October 2012. Retrieved 12 October 2012. ^ "Leichtfried zu Stadler: Chaos bei BZÖ – EU-Mandat durch Lissabon plötzlich akzeptabel" (in German). 17 December 2009. Retrieved 21 February 2014. ^ "Nachbaur: "Die Neos sind ein moderner Männerklub" - derStandard.at". DER STANDARD (in German). Retrieved 4 April 2019. 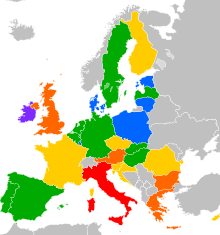 ^ "Results of the 2009 European Elections". European Parliament. Retrieved 6 December 2016. ^ "Results of the 2014 European Elections". European Parliament. Retrieved 6 December 2016. ^ "Bulgaria puts off Eurozone membership for 2015". Radio Bulgaria. 26 July 2011. Archived from the original on 29 March 2012. Retrieved 2 September 2012. ^ "Привърженици на "Атака" свалиха знамето на ЕС от пилоните пред НДК" (in Bulgarian). Дневник. 3 March 2016. Retrieved 3 March 2016. ^ Kolyako, Nina. "Czech Republic is in no rush to implement euro". The Baltic Course. Retrieved 4 March 2011. ^ "Svobodní: Výzva senátorům". Svobodni.cz. 5 February 2009. Archived from the original on 18 July 2011. Retrieved 18 February 2015. ^ "Svobodní: Veřejné čtení Lisabonské smlouvy již tuto neděli". Svobodni.cz. 15 April 2009. Archived from the original on 20 August 2011. Retrieved 18 February 2015. ^ "Lisbon treaty turmoil as Czechs demand opt-out". The Guardian. 9 October 2009. Retrieved 29 July 2015. ^ "Svobodní: Evropa svobodných států". Svobodni.cz. Archived from the original on 1 September 2010. Retrieved 18 February 2015. ^ "Czech government rejects President's call for referendum on EU, NATO". Reuters.com. 1 July 2016. ^ "Européenes : l'UMP en tête, le PS en fort recul". Le Monde (in French). 7 June 2010. Retrieved 12 February 2010. ^ "Européenes : la dynamique inédite du eurosceptcism" (in French). Euros du village. 29 April 2010. Retrieved 12 February 2010. ^ "Europe" (in French). Front National. Archived from the original on 13 October 2009. Retrieved 12 February 2010. ^ "Résolution du Parti de Gauche sur l'euro" (in French). Worldpress – Politique à Gauche. 10 April 2011. Retrieved 29 July 2015. ^ "Leur Europe n'est pas la nôtre !" (in French). NPA. 19 May 2010. Retrieved 12 February 2010. ^ "L'Europe" (in French). Lutte Ouvrière. Retrieved 12 February 2010. ^ "EU election: France's Hollande calls for reform of 'remote' EU". BBC. 27 May 2014. Retrieved 28 January 2015. ^ "Parties and Election in Europe". 2014. ^ Carla Bleiker (11 March 2013). "German party says 'no' to the euro, 'yes' to the EU". DW Online. Retrieved 9 March 2016. ^ "German anti-euro AfD party wins seats in east". BBC News. 15 September 2014. Retrieved 28 January 2015. ^ "AfD chief Lucke denies plans to split the party". Deutsche Welle. 19 May 2015. Retrieved 27 May 2015. ^ "Parliamentary Elections January 2015". Ministry of Interior. Retrieved 28 July 2015. ^ "Greece turns, Europe wobbles". The Economist. Retrieved 19 July 2015. ^ "BBC News Greece election: Anti-austerity Syriza wins election". BBC News. Retrieved 28 January 2015. ^ "hu:Új politikai hangnemet szorgalmaz az LMP" [LMP to encourage new political voice] (in Hungarian). Hungarian News Broadcast. 17 April 2014. Archived from the original on 13 May 2014. Retrieved 22 April 2014. ^ "Gloating Verhofstadt attacks Farage's claim Ireland could follow Brexit and quit EU". Express.co.uk. 8 May 2018. Retrieved 9 May 2018. ^ "Over 60% of people say the EU is more important to Ireland than the UK". newstalk.com. Retrieved 19 December 2016. ^ "Strong majority want a Minister for Brexit, according to poll". ^ "Little public support for "Irexit" - Latest national Eurobarometer results". ^ "Poll suggests 88% of Irish people want Ireland in EU". rte.ie. ^ "Should Ireland leave the EU? New poll shows only 10% of voters would back 'Irexit'". The Journal. 10 February 2018. ^ Department of Foreign Affairs (Ireland) [@dfatirl] (8 May 2018). "Support for Ireland remaining in the EU has jumped to over 90%" (Tweet) – via Twitter. ^ Richard Sinnott; Johan A. Elkink (July 2010). "Attitudes and Behaviour in the Second Referendum on the Treaty of Lisbon" (PDF). Department of Foreign Affairs and Trade of Ireland. Archived from the original (PDF) on 25 December 2010. ^ "Lisbon Treaty is unchanged and must be rejected". peoplebeforeprofit.ie. Archived from the original on 4 June 2016. ^ "IRSP OPPOSE SECOND REFERENDUM: BUT URGE A NO VOTE". IRSP. ^ "General Election Manifesto 2016" (PDF). Sinn Féin. p. 30. Retrieved 1 May 2018. Recent governments have been totally deferential to the EU and its most powerful member states. ...[W]e will: uphold the right of democratically elected governments to decide their social and economic priorities in the interests of their own people; seek to return powers to EU member states and increase the influence of member state parliaments in the EU legislative process; support reforms of the EU which are aimed at reducing the power of the European Commission, making it more transparent and accountable to the European and member state parliaments; and increasing the influence of smaller member states. ^ Kevin Bean (2008). The New Politics of Sinn Fein. Oxford University Press. p. 171. ISBN 978-1-78138-780-1. Retrieved 9 March 2016. ^ Moriarty, Gerry (20 April 2015). "SF says North should be able stay in EU in a Brexit". The Irish Times. Retrieved 29 January 2016. ^ "Ireland, Brexit and why the EU must be opposed". Socialist Party. 28 June 2016. Retrieved 10 February 2017. ^ "EU – A force for progress or profits?". Socialist Party. 17 June 2015. Retrieved 10 February 2017. ^ "For a European struggle against austerity – For a socialist Europe". Socialist Party. 20 April 2012. Retrieved 10 February 2017. ^ "Grillo: «Referendum sull'euro entro un anno". Corriere della Sera. Retrieved 28 January 2015. ^ Caprara, Maurizio (24 July 2008). "Passa all'unanimità il Trattato europeo". Corriere della Sera. Milan. Archived from the original on 22 July 2011. ^ "The small political parties that risk obliteration under Italy's new electoral law". The Local. 2 June 2017. Retrieved 16 August 2017. ^ "Programma del Movimento La Fiamma Tricolore" [Programme of the Movement Tricolour Flame] (in Italian). Tricolour Flame. Retrieved 16 August 2017. ^ Durantini, Ermanno (28 September 2016). "Intervista a Roberto Fiore" [Interview with Roberto Fiore] (in Italian). Retrieved 16 August 2017. ^ "Solidarietà ed Unione Europea" [Solidarity and the European Unione] (in Italian). National Front. 21 January 2017. Retrieved 16 August 2017. ^ "Intervista a Simone Di Stefano sull'Unione europea" [Interview with Simone Di Stefano on European Union] (in Italian). CasaPound. Retrieved 16 August 2017. ^ "Il PCI alla manifestazione del 25 Marzo contro l'UE e la NATO" (in Italian). Italian Communist Party. 20 March 2017. Retrieved 16 August 2017. ^ "Atto costitutivo e statuto" (PDF) (in Italian). Sovereignist Front. Retrieved 16 August 2017. ^ "L'Unione europea" [The European Union] (PDF) (in Italian). MMT Italy. Retrieved 16 August 2017. ^ Cremaschi, Giorgio (20 March 2013). "Il fallimento dell'euro" [The failure of the euro] (in Italian). Retrieved 16 August 2017. ^ "Will Italy be next to reverse out of the EU". The Irish Times. 16 March 2017. ^ Armellini, Alvise (24 April 2015). "Anti-euro talk spreads in Italy". EUobserver. Retrieved 16 August 2017. ^ Pozzati, Daniele (30 August 2016). ""Flawed and Ideological": How the "German" Euro Threatens Europe". Sputnik. ^ "Passaparola - Euromaniacs? The real buzz is to say no, by Diego Fusaro". Beppe Grillo' Blog. Retrieved 16 August 2017. ^ Badiale, Marino (13 May 2014). "Uscire dalla trappola dell'euro" (in Italian). Istituto Affari Internazionali. Retrieved 16 August 2017. ^ "Standard Eurobarometer 87". European Commission. Retrieved 17 August 2017. ^ "Eiroskepticisms – no ideoloģijas par politisku līdzekli" (in Latvian). ^ Patrick Dumont; Fernand Fehlen; Raphaël Kies; Philippe Poirier (January 2006). "Les élections législatives et européennes de 2004 au Grand-Duché de Luxembourg" [The Legislative and European elections in 2004 in the Grand Duchy of Luxembourg] (PDF) (in French). Chamber of Deputies: 220. Retrieved 9 March 2016. ^ "PVV: EU-droom is nu nachtmerrie" (in Dutch). NOS. 19 May 2014. Retrieved 26 May 2014. ^ "Standpunt: Europese Unie – superstaat nee, samenwerken ja" (in Dutch). SP website. Archived from the original on 24 May 2014. Retrieved 26 May 2014. ^ "Stemden we voor of tegen Europa?" (in Dutch). NOS. 23 May 2014. Retrieved 26 May 2014. ^ "Dutch referendum voters overwhelmingly reject closer EU links to Ukraine". The Guardian. Amsterdam. Reuters. 7 April 2016. Retrieved 7 April 2016. ^ "Dutch referendum a difficult result for EU and Ukraine". BBC News. 7 April 2016. Retrieved 7 April 2016. ^ Jasmin Mujanovic, Hunger and Fury: The Crisis of Democracy in the Balkans, Oxford University Press, 2018, ISBN 0190877391, pp. 115; 162. ^ Sarantis Michalopoulos, Tensions grow before biggest secret is revealed: FYROM's new name, EURACTIV Jan 18, 2018. ^ Vassilis Petsinis, From pro-American to pro-Russian? Nikola Gruevski as a political chameleon. 22 May 2015. openDemocracy. ^ Aubrey Belford et al., Leaked Documents Show Russian, Serbian Attempts to Meddle in Macedonia. 04 June 2017, Organized Crime and Corruption Reporting Project. ^ Hilary White (9 April 2008). "Poland Ratifies Lisbon Treaty with Opt-Out from EU Human Rights Charter". Catholic Exchange – Sophia Institute Press. Retrieved 29 July 2015. ^ "Polish President slams government eurozone drive". The Times. Malta. 25 May 2009. Retrieved 29 July 2015. ^ Poland 'more anti-Brussels' despite getting largest share of EU cash. Euronews. Author - Chris Harris. Last updated 8 July 2015. Retrieved 22 August 2017. ^ "SONDAJ - Euroscepticismul nu prinde la români". Retrieved 5 August 2016. ^ "La CUP incrementa un 10% les agrupacions locals i un 30% la militància el 2013". ara.cat (in Spanish). 12 May 2014. Retrieved 26 October 2016. ^ "CONSTITUCIÓN EUROPEA – Resultados del Referéndum 2005" [European Constitution – Referendum Results 2005] (in Spanish). European Parliament. 2005. Archived from the original on 26 February 2005. ^ Szczerbiak et al (2008), p. 183. ^ Vår politik A till Ö | Sverigedemokraterna. Sverigedemokraterna.se (9 october 2018). ^ "How UKIP became a British political force". BBC News. 3 May 2013. Retrieved 6 February 2017. ^ "The Conservative Party split over Brexit". LSE BREXIT. 5 April 2016. Retrieved 6 February 2017. ^ Goodenough, Tom (16 February 2016). "Which Tory MPs back Brexit, who doesn't and who is still on the fence?". Coffee House. The Spectator. Retrieved 6 February 2017. ^ Mason, Rowena (30 May 2016). "Labour voters in the dark about party's stance on Brexit, research says". The Guardian. Retrieved 6 February 2017. ^ Cooper, Charlie (21 June 2016). "Corbyn is now genuinely against Brexit - but is it too little too late?". The Independent. Retrieved 6 February 2017. ^ Withnall, Adam (24 June 2016). "It's official: Britain has voted to Leave the EU". The Independent. ^ Dickie, Mure (24 June 2016). "Scots' backing for Remain raises threat of union's demise" – via Financial Times. ^ "NOU 2012: 2: Utenfor og innenfor" [NOU 2012: 2: From outside and within]. Norwegian Ministry of Foreign Affairs (in Norwegian). 2010. Archived from the original on 20 October 2013. Retrieved 28 September 2012. ^ "EU sanctions against Russia over Ukraine crisis"; via the official website of the European Union. ^ "Envoy blasts EU anti-Russian sanctions human rights violation". RT. 11 December 2015. Retrieved 11 January 2016. ^ "Ukraine dismisses Russia's call for cease-fire". Boston Globe. 1 September 2014. ^ Keating, Dave (23 October 2013). "San Marino rejects EU accession". Politico. ^ Marceddu, David (19 October 2013). "San Marino al voto per l'ingresso in Ue". Il Fatto Quotidiano (in Italian). ^ "San Marino dice no all'Europa: il referendum non raggiunge il quorum". Il Fatto Quotidiano (in Italian). 21 October 2013. ^ Miserez, Marc-Andre (2 December 2012). "Switzerland poised to keep EU at arm's length". swissinfo. Retrieved 10 April 2014. ^ Keiser, Andreas (30 November 2012). "Swiss still prefer bilateral accords with EU". Swissinfo. Retrieved 10 April 2014. ^ Kuenzi, Renat (15 May 2014). "'We're Not the Only EU Sceptics'". Swissinfo. Retrieved 4 April 2016. ^ "Über Uns". Campaign for an Independent and Neutral Switzerland official website. Retrieved 4 April 2016. ^ a b "Survey: Tighten Borders but Keep EU Accords, Say Swiss". thelocal.ch. 19 May 2016. Retrieved 17 June 2016. ^ "Vatan Partisi hariç hepsi NATO ve AB yanlısı! İşte partilerin dış politikaları" [All parties except Homeland Party are pro-NATO and the EU! Here are the foreign policy of the party] (in Turkish). Ulusalkanal.com.tr. 6 May 2015. Retrieved 29 July 2015. ^ "TKP, NATO'ya, ABD'ye ve Avrupa Birliği'ne neden karşı?" [CAP, NATO, the United States and the European Union against reason?] (in Turkish). Tkp.org.tr. 13 August 2013. Archived from the original on 18 May 2015. Retrieved 29 July 2015. ^ "Profile: Ukraine's 'Right Sector' movement". BBC News. 21 January 2014. Robert Harmsen; Menno Spiering, eds. (2004). Euroscepticism: Party Politics, National Identity and European Integration. Rodopi. ISBN 90-420-1946-8. Aleks Szczerbiak; Paul Taggart (2008). Opposing Europe? : The Comparative Party Politics of Euroscepticism. 1: Case Studies and Country Surveys. Oxford University Press, Oxford. ISBN 978-0-19-153162-0. Florian Hartleb (2015). A Thorn in the Side of European Elites: The New Euroscepticism. Wilfried Martens Centre for European Studies. ISBN 978-2-930632-09-4. Luis Martin-Estudillo (2018). The Rise of Euroskepticism: Europe and Its Critics in Spanish Culture. Vanderbilt University Press. ISBN 9780826521941.